Hello. Hope you're having a great Tuesday. I'm going to lunch with friends today, so I'm posting early. I found the template for this 6" round calendar at http://www.papershapez.com/. I cut the back 6" circle and the front circle with decorative scissors because it is hard to cut a perfect circle with scissors. I printed the calendar middle section on colored paper. The sentiment is an old stamp and I believe the quote is by Eleanor Roosevelt and not Nancy Reagan. I distressed the edges of the sentiment circle. This little calendar has so much potential. 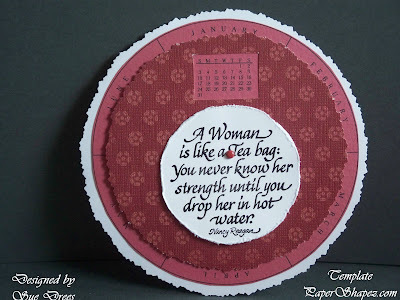 The template is not free, it was $ 1.99, but the calendar is included along with the different sized circles. If you printed the calendar in a light color you could highlight birthdays or other special days. great sentiment on your calendar! Wowww Sue,what beautiful,i love the papers and colours. I love it ...where can I get a calendar stamp like this? As usual Sue wonderful job. This is stunning and I love the sentiment!